Welcome back to another Monday Swatch & Review! Before I get started, about 2 weeks ago, I posted a Press Release of all the “throw-backs’ and Black Friday news from P&P. I hope you had an opportunity to take advantage of the pre-order or at least marked your calendar for the WEEK LONG Black Friday sales/offers. If you didn’t get a chance to read it, make sure you do here. As promised, today I have polishes from the Winter Collection by Pretty & Polished (P&P). This collection contains 12 new shades split between 4 finishes; crellies, glitters, cremes and multi-chromes. To keep things exciting and you wanting more, I have a partial swatch and review, 4 polishes, 1 with each finish. 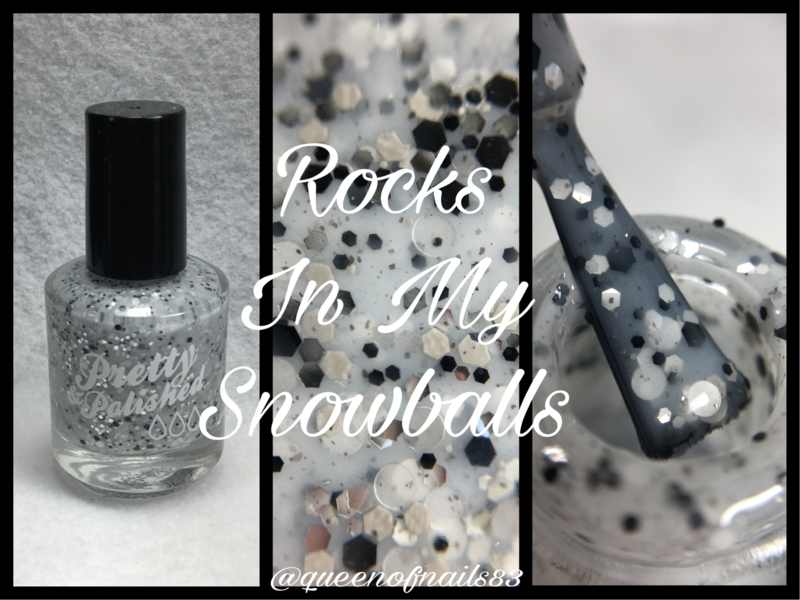 *Rocks in my Snowballs: A white crelly polish packed with white, gray, and black glitters. 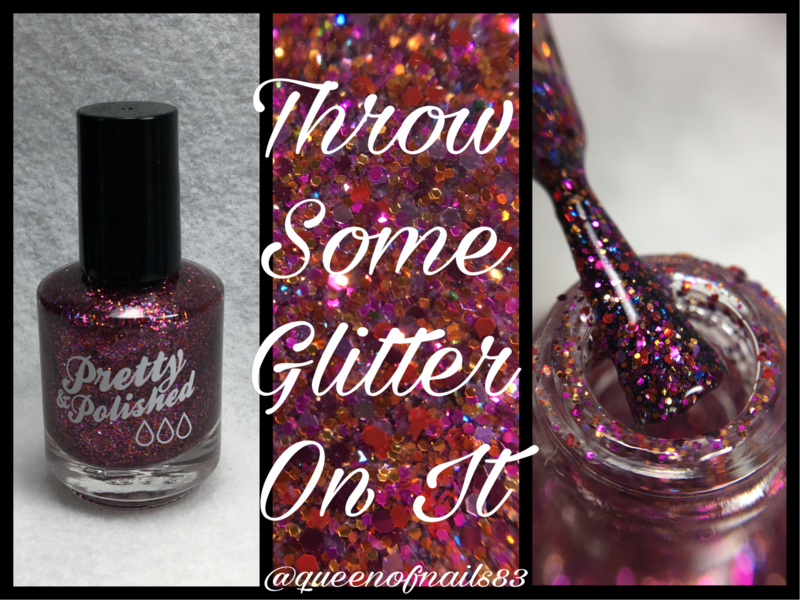 *Throw Some Glitter On It: A full coverage glitter bomb packed with pinks, purples, blues, oranges, coppers, and a scattering of color shifting flakes. 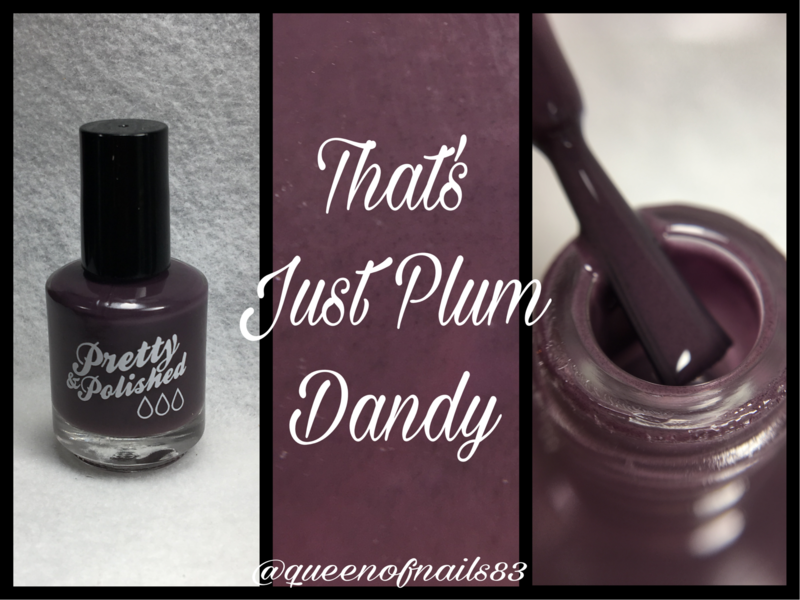 *That’s Just Plum Dandy: A dark plum purple Dusty Creme. *Sleighing It! : A red to orange multi-chrome polish with a strong linear holo effect. Formula: ♥♥♥♥♥ 5 out of 5 of their ideal formula and great consistency. No issues to report. Opaqueness: ♥♥♥♥♥ 5 out of 5 because these polishes are opaque in 2-3 coats. The glitters did not require sponge application because the are dense and packed enough to be opaque with regular application. 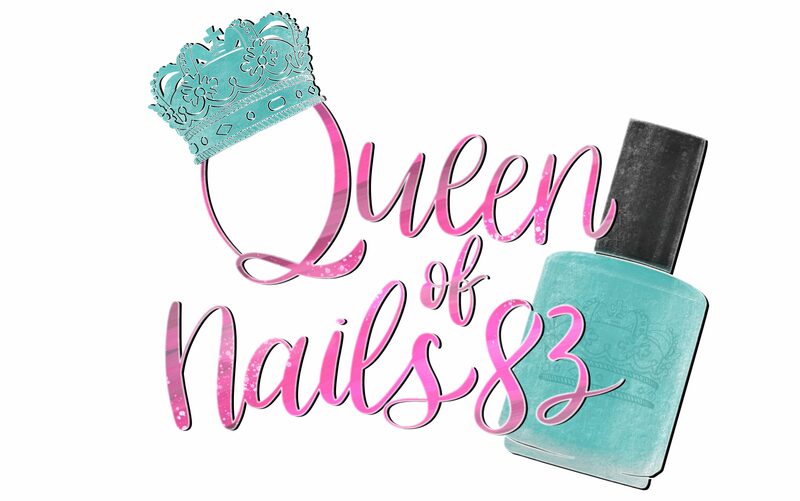 Overall: ♥♥♥♥♥ this collection is getting a 5 out of 5 from me based on the 4 of the 12 polishes I reviewed. I love the names of these polishes and how well the looked shiny, matte or with nail art. The Winter Collection releases TODAY, Monday, Nov. 14th and polishes will prices accordingly: Crellies $8.50, Glitters $8.50, Dusty Cremes: $7.50 and Multi-Chromes: $9. But you can score the entire collection for $90!! That’s a $11.50 SAVINGS AND purchasing the whole collection qualifies for free domestic shipping!!! Your stamping with That’s Just Plum Dandy is great! I love the mustard you chose to pair with it! that purple is lovely. I love muted creams. Chlesea’s dusty cremes really are in a class of their own. Gorgeous swatches! I love the stamping you did with Rocks in my Snowballs! Ohh, Rocks in my Snowballs is so pretty! I always love a nice glitter crelly! I really love that plum creme, especially matte! Thats just plum dandy is BEAUTIFUL! Gorgeous swatches! I’m really diggin’ That’s Just Plum Dandy.. it’s the perfect mix of pretty and cool!